Surgery is a craft specialty: ‘doing’ in response to what is seen, felt and anticipated. The potent odours and the raw images of flesh, elicit strong sensations and responses in the here-and-now or ‘thisness’ (haecceities) of practice. These experiences, trigger a world of affects and senses that can disturb or　rupture familiar or established ways of thinking and knowing. 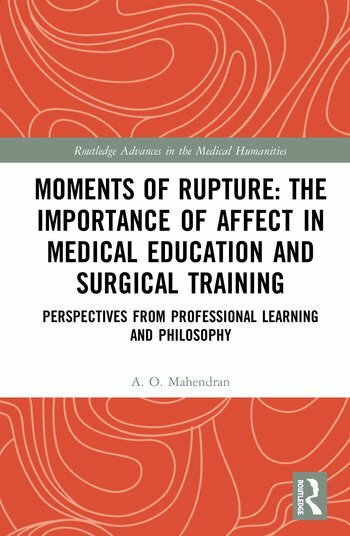 This book attempts to articulate these emotional complexities of learning and practice by exploring affective encounters with the uncertainty of medical events. Employing a practice based inquiry, grounded in philosophical notions of affect and related concepts, real stories of actual practice are analysed and theorised to examine how events of clinical practice come to matter or become meaningful to surgeons, potentially disclosing new or modified capacities to see, think, understand and act. The philosophical writings of Alfred North Whitehead, Gilles Deleuze, Gilbert Simondon and Brian Massumi inform the exploration. The critical discussions of this book are relevant for healthcare professionals, medical educators, practitioners and researchers interested in its main exploration: the affective conditions that emerge from disturbances in practice and their power to shape, construct and transform how professionals understand their practice and function within it. A.O. Mahendran is senior lecturer and consultant transplant surgeon at Queen Mary University/Barts and the Royal London Medical School, where she is also programme director for the MSc. in Physician Associate Studies. She undertook her specialist surgical training in London and New York and completed a PhD in Education at Goldsmiths’, University of London. She was the 2018 Winner of the (BERA) British Educational Research Association Doctoral Thesis Award. Arunthathi Mahendran was awarded Best Doctoral thesis 2018 by the British Educational Research Association which formed the basis for this book.